Description: Moose are the largest members of the deer family weighing about 600 kg (1322 lbs) and standing over 2m (6ft) at the shoulder. 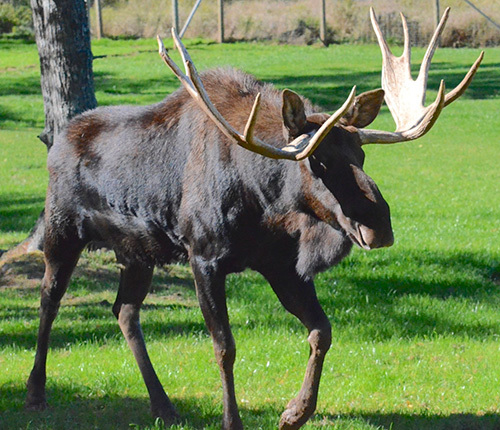 Males (bulls) develop broad, shovel-shaped antlers, which they shed each winter and regrow in spring. Antlers of a mature male may span 2m (6ft) or more. The name moose is derived from an Algonquin word meaning "eater of twigs". 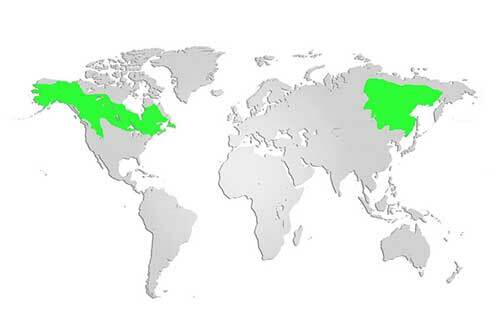 Distribution and Habitat: Moose are found across Canada, Alaska, Russia and Scandinavia. There is some academic debate regarding the potential of moose species in which recent DNA studies suggest that the moose found in Alaska and Siberia are a hybridization of European moose (known as elk in Europe) and North American moose, which are actually two separate species. However, as stated in the IUCN Red List of Threatened Species information, “further research is needed before a consensus would support species-level classification. The mainland population of moose in Nova Scotia is listed as endangered, with estimations of fewer than 1500 individuals currently living between Canso, Amherst and Yarmouth. Moose require a habitat of water bodies and wetlands for foraging and dense forested areas for winter protection. Diet:Herbivores, the diet of moose consists primarily of leaves tender twigs browsed from shrubs and trees, and includes the nutritionally rich leaves and tubers of aquatic plants when available. Life Cycle: Moose mate in mid-September to late November with calves being born in the spring. Females (cows) mature in 2 to 2.5 years. Because of competition from older bulls, young males seldom have the opportunity to mate until they are 5 or 6 years old. Moose are susceptible to a parasite (brain worm, P.tenuis) carried by white-tailed deer. The worm affects the central nervous system of moose and caribou. The symptoms, commonly called "moose sickness", may include partial paralysis, loss of fear, and disorientation. Animals infected with this parasite have a very slim chance of recovery as the symptoms make them easy prey and prone to risky behaviour (entering urban areas or lingering on highways). Moose are preyed upon by bears, wolves and cougars, especially while very young. Adaptations:The long legs of moose allow them to wade in wetlands and deep snow. They are agile swimmers, capable of diving to forage among the roots of aquatic plants, and swimming several kilometres at a time. Hollow hairs in their dense brown coat trap air and act as insulation during cold weather and increase buoyancy while in the water. Did you know? The Nova Scotia mainland moose is endangered and it is important to report sightings by contacting your local Nova Scotia Department of Natural Resources or filling in the Mainland Moose Sighting form.